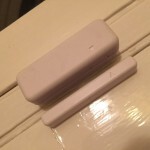 We’ve been controlling our central heating with our Hive Active Heating controller for a couple of years now with no complaints (read our review here) and have been eagerly awaiting the release of more Hive peripherals to enable us to control our home. Hive announced last summer that they were going to release a handful of peripherals; an active plug, motion sensor, door/window sensor and smart bulb. 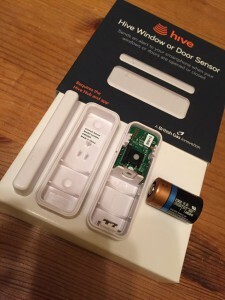 We’ve already purchased and reviewed the active plug here, now it’s time to put the door sensor through its paces. It is worth noting that a working Hive Hub is required for the door sensor. 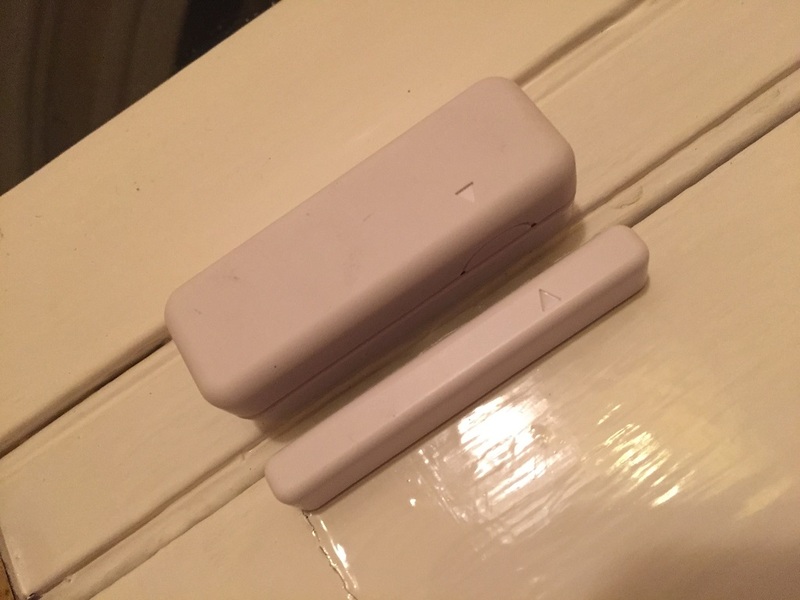 The sensor arrives nicely packaged, and resembles a magnetic reed sensor for a home alarm system, which is essentially what it is. It is in two parts; a sensor and magnet, and comes complete with a Duracell CR2 battery, and some pre-cut double-sided 3M fixing tape. It’s a doddle to set up. From the Hive App, select Devices, then Install Devices. You are given the option to upgrade to Hive 2, or add another device. After selecting the latter option, the hub will start scanning for new devices on the network. At that point I installed the battery into the sensor, taking care to get the polarity correct, and within a couple of minutes, the sensor was registered with Hive. As everything seemed to be working at that point, I put the battery cover on the sensor body (it’s a bit of a stiff fit) and tested it before fitting by moving the thinner magnet bar towards and away from the sensor. Fixing the sensor to the door posed no problems with the supplied tape, observing the manuals recommendation of a 5mm gap between the sensor and the magnet bar. 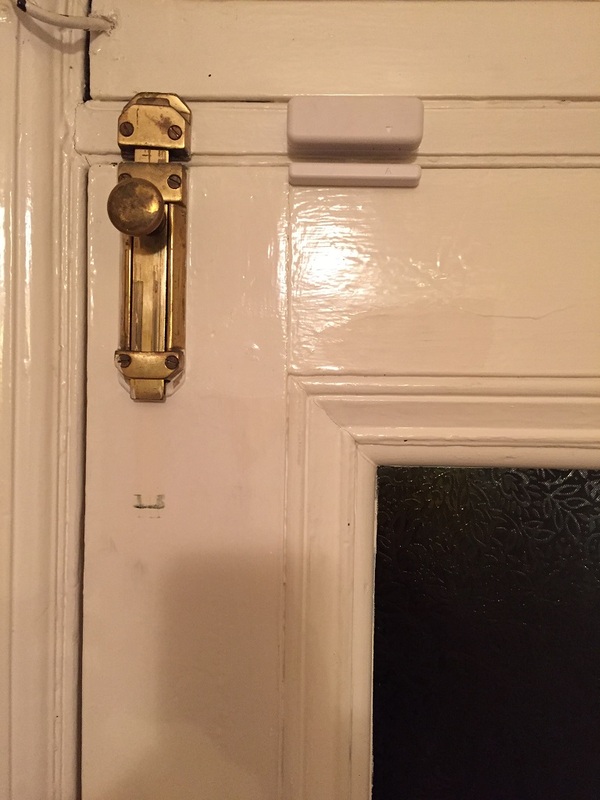 Our installation has a slightly wider gap (nearly 10mm), yet works just fine. There is a green LED on the sensor which flashes when the door opens and closes, handy for debugging issues. There are no range issues. I’m getting a full signal strength on the sensor (as viewed in Manage Devices), which was a concern of mine before installation as it is some distance from the hub. It was not clear from the website what functionality Hive provide for the sensor. At the moment it appears to be limited to sending a text and/or email when the door is opened or closed. Thankfully, to prevent information overload, alerts can be scheduled, so I’ve set ours up to send an email when the doors are either opened or closed, on Saturdays, between the hours of 6am and 8pm. This is our changeover day, and it’s handy to know when guests have departed and arrived, and when the cleaners have been in. When the property is empty, I can then set Hive to always send emails, so the system will act like a silent alarm system. There are some limitations; emails are not instant, and you have to refresh the Hive app to see the current status of the door sensor. 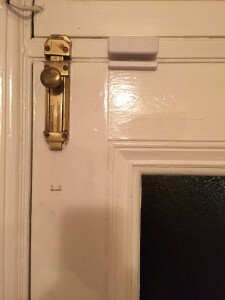 It would also be handy to have a debounce feature, to prevent floods of alerts if a door is repeatedly opened and closed over a short period. 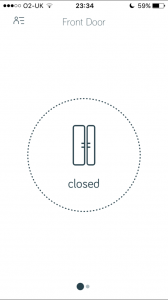 Integration with other Hive peripherals is notably absent – it seems obvious to be able to turn a light on or off (either via the Active Bulb or Plug) with a delay after a door is opened. It’s early days yet and that functionality may be being planned. My gut feeling is that the sensor will come into its own when Hive finally release an API or integrate with IFTTT, and owners can create their own recipes to link Hive Door Sensors with other Hive peripherals and the wider Internet of Things.